The ESI team has the necessary experience and vision to help you transform your kitchen into the highlight of your entire house. Kitchen remodeling can vastly improve the most important room of the home’s functionality through the introduction of additional space and updated appliances. Additionally, the new look and feel will not only make a good first impression but it will also increase your home’s overall value. At ESI, we firmly believe in the importance of having a kitchen that matches your lifestyle. Therefore, whether your main focus is on creating elaborate meals or simply having a lot of space for entertaining, we can help! We will take the time to get to know and understand the many ways that you utilize your kitchen in order to create the ideal space for your needs. In other words, your newly remodeled kitchen will be tailored toward your culinary interests. We also take pride in offering exemplary customer service. This means that we focus on giving you a smooth experience on top of a final result that you can be proud of for many years to come. We understand that each kitchen remodeling process is disruptive to our clients’ daily lives, so we take steps to minimize this impact. Many people have a difficult time envisioning how to expand their kitchen space, but our remodeling experts will make it easy to go from your current look to one that is much more space efficient. For some kitchen remodels, this means switching your counter from an L to a U shape. In other cases, we have adjusted the height of the kitchen cabinets to make sure that they can be easily reached and used for storage purposes. Other important factors that we take into consideration include the proper traffic flow and your desired usage of the space. This becomes very critical for large families or couples that enjoy cooking together. Instead of bumping into each other, your new kitchen will be designed to give everyone enough room to move, chop vegetables and work throughout the area at the same time. We also place an emphasis on storage solutions because we understand how important it is to have everything close by without allowing your kitchen to become cluttered. 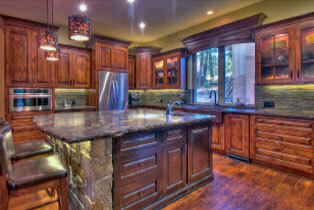 Each of our kitchen remodels is constructed out of the finest possible materials. Our expert builders deliver the same high quality craftsmanship for every counter, fixture and piece of wood, so you can rest assured that we will create the kitchen of your dreams. ESI’s team has a background in energy-efficient construction, and we can put these skills to good use if you are planning an environmentally friendly kitchen remodeling project. Additionally, we ensure that you will receive top-notch quality by retaining a professional, highly trained staff. Contact ESI today to learn more about how we can improve the flow and look of your kitchen, while simultaneously boosting the value of your home. Our expert team will walk through your current kitchen and discuss your goals with you so that we can create a space that will accommodate all of your functional and aesthetic desires.